We’ve seen a plethora of media adaptations of middle grade books recently, presenting a golden opportunity for reader’s advisory. Not only can you promote the books these series and films are based on, but they’re an excellent starting point for suggesting similar titles. Plus, linking books to TV shows and movies can be a way to reach students who love stories but don’t normally gravitate towards reading. Here are read-alike recommendations for a handful of recent or upcoming adaptations based on books. 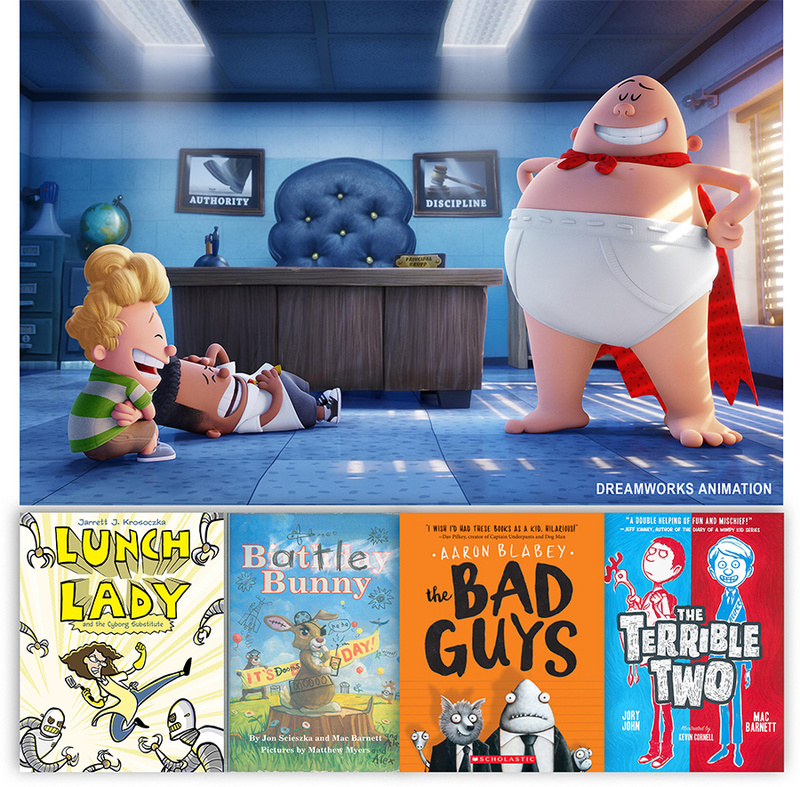 Dav Pilkey’s “Captain Underpants” book series is a perennial favorite and was turned into a feature film, Captain Underpants: The First Epic Movie, in 2017. It has also been adapted into a Netflix streaming series, The Epic Tales of Captain Underpants, which was released in July 2018. The Bad Guys by Aaron Blabey (Scholastic, 2016) This series starter features wacky humor in both the text and illustrations as Mr. Wolf, Mr. Piranha, Mr. Snake, and Mr. Shark set out to prove that bad guys can change their tune. Lunch Lady and the Cyborg Substitute by Jarrett Krosoczka (Knopf, 2009) Lunch Lady may seem like an unassuming cafeteria worker, but she’s actually an undercover secret agent, serving out justice and protecting the school. The Terrible Two by Mac Barnett (Abrams, 2015) When Miles Murphy, known prankster, starts at a new school, he sets off an epic prank war with the school’s current trickster. This laugh-out-loud funny series opener combines text with cartoon illustrations and is also hilarious on audio. The 1973 book by John Bellairs was recently turned into a feature film, introducing it to a new audience of viewers (and readers). The Bad Beginning by Lemony Snickett (HarperCollins, 1999) The atmospheric, darkly humorous “Series of Unfortunate Events” stars the Baudelaire children forced to live with a distant relative as their guardian. Bonus hook: this series is being adapted as a Netflix series with two seasons currently available and a third season upcoming. The Cavendish Home for Boys and Girls by Claire Legrand, (S. & S., 2012) When her best (and only) friend disappears, Victoria must sneak into the Cavendish Home for Boys and Girls, where children go in but they don’t come out. Kids in search of a creepy read need look no further. Spirit Hunters by Ellen Oh (Harper, 2017) Rumor has it that the Raine family has moved into a haunted house, which Harper doesn’t believe until her little brother starts acting very strange. This is a high-stakes mystery with plenty of scares for young readers. Already a beloved favorite of many, Madeleine L’Engle’s Newbery Medal-winning novel was turned into a movie in 2018 with Oprah Winfrey and Reese Witherspoon. The Glass Sentence by S.E. Grove (Viking, 2014) This time-twisting adventure story finds Sophia searching for her kidnapped uncle and navigating a world in which each continent has been thrust into a different historical time period. Once Was a Time by Leila Sales (Chronicle, 2016) When Lottie is transported from World War II England to present-day Wisconsin, she must find her way back to her best friend Kitty. This novel combines time travel with a heartfelt story of searching for loved ones. When You Reach Me by Rebecca Stead (Wendy Lamb, 2009) Twelve-year-old Miranda starts getting notes from someone who knows about things in her life that haven’t happened yet. Memorable characters, including one who related to Meg from A Wrinkle in Time, and a science-fiction twist make this a great companion to the movie. The first book in Philip Pullman’s “Golden Compass” series was adapted into a feature film in 2007; this year the series is getting a media reboot with a TV series adaptation from BBC One in 2019. The Girl Who Drank the Moon by Kelly Barnhill (Algonquin, 2016) Luna has been raised by a witch and a host of friendly creatures, but as her 13th birthday approaches, she must learn to wield the magic within her. Rebel Genius by Michael Dante DiMartino (Roaring Brook, 2016) In Giacomo’s Renaissance-inspired world, art is outlawed. When a Genius, a birdlike creature that inspires artists, bonds with Giacomo, he knows he’s in trouble—unless he can hide. Breadcrumbs by Anne Ursu (Walden Pond Press, 2011) Hazel must make her way through an enchanted wood to save her friend Jack in this modern-day fairy tale. Readers and viewers who appreciate the deep friendships and atmospheric setting of The Golden Compass will want to pick up this book. This first book in Philip Reeve’s steampunk series will be released as a feature film in December 2018. Airborn by Kenneth Oppel (Eos, 2004) Matt is a cabin boy on an airship helping a young passenger search for mysterious winged creatures that are said to live in the clouds in this adventure. The steampunk setting and action-packed plot will appeal to readers and viewers of Mortal Engines. Leviathan by Scott Westerfeld (S. & S., 2009) This steampunk adventure imagines an alternate 1914 Europe where the “Central Powers” have developed mechanized war machines and the “Entente Powers” have created genetically-engineered war beasts. Worldshaker by Richard Harland (S. & S., 2010) This steampunk fantasy is set on a massive ship where Elites rule the top decks and Filthies are forced to live below. When Col, an Elite being groomed to take over as Commander, meets a fugitive Filthy, he begins to learn more about his society than he could have imagined. Abby Johnson is the collection development leader at the New Albany-Floyd County Public Library in Indiana and served on the 2015 Newbery Committee. You can find her on the web at abbythelibrarian.com.